It is the best possible approach to take to your lives when you operate from the position that every moment that you spend here is a gift. Oftentimes your lives can seem like a sentence, and you have often been told that your lives are a test. But what if you being here was the absolute most exciting experience you could be having? Trust us when we say that you knew you wanted the rollercoaster ride of Earth before you incarnated here. Now, if you are truly grounded in your physical body, and are consciously breathing, you have everything that you need to make the most of the moment that you are in. Practicing mindfulness and being present, these are the approaches of the holiest of people on your planet. When you have an opportunity to experience something, and you invest all of who you are into it, that experience can become anything at all that you want it to become. This is how you create your reality. 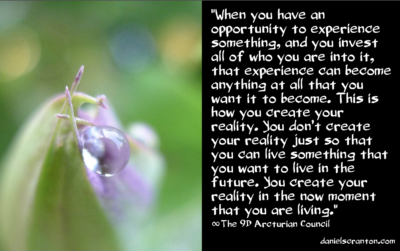 You don’t create your reality just so that you can live something that you want to live in the future. You create your reality in the now moment that you are living, and then with your consciousness, you can stretch out that moment so that it becomes your next now, and your next, and your next. We are suggesting that you begin to see life on planet Earth as a gift and that you let go of the struggle. Releasing is a very spiritual act, but it doesn’t mean giving up on living the life that you want to live. It means letting go of the idea that you are not living that life right now.